Pictures add life and interest to a room and allow you to add personal touches to it. Be it a family photograph, a painting by your favourite artist or simply a beautiful frame across, one of the natural ways to hang it on the wall is to use nails with hammer. However, nails leaves gruesome marks on the wall during the process. While you are digging in the nail, the wall under it gets destroyed. The marks are permanent and can only be erased with filling and wall paint. The process in itself is very painstaking, requiring energy and includes risk of the hammer hurting the hand holding the nail. Luckily, there are many other options out there that allow us to hang pictures without using a hammer and nails. These techniques are easy to use and most of them allow you the flexibility to alter the position when you are not satisfied with the angle or position of the frame. No more need to hide ugly nail marks. Our step by step guide has the best alternatives for you. Commercial hanging strips are readily available in the market. You simply have to peel off the sticker and paste them on the back of the picture and press on to the wall. Contrary to common belief, high quality strips are capable of supporting heavy weights. The ease of use makes them a favourite among home owners. Place stickers on the four sides of the back of the picture frame and it will give it enough support. The best part about them is you can simply take them off the wall when you want to change the picture. These hangers work on the same principal as the strips. 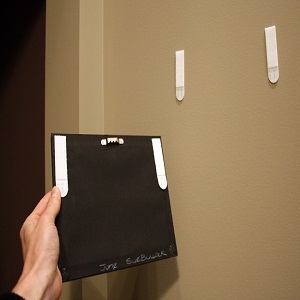 The difference is that while one side of them is flat and sticks to the wall, the other side has a hook that goes into holes or marks your frame has for hanging. These hangers also come in fancy shapes and colours and allow you to customize your space. Roll some poster putty and stick it to the back of your picture frame. 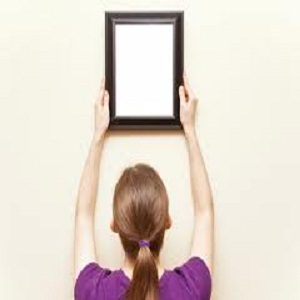 Now pick up the frame and press it on against the wall, on the position you want it. Keep the pressure for some time and you are done hanging the picture without any hammer or nail. 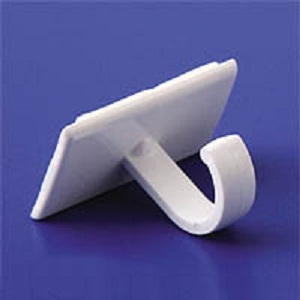 It is especially convenient for low weight frames and posters. 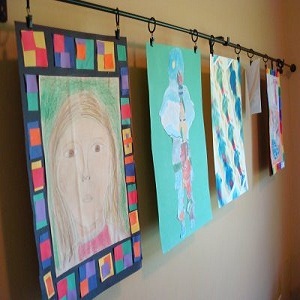 Another option viable for arts and craft sessions is to install a clothesline and then use it to hang a number of pictures. It is a viable option for kids exhibitions at school and art classes. The clothesline can remain permanent while you can easily change the pictures.